The Military-Family: It's Hot in the Kitchen... and we want Chocolate! When I grew up chocolate chips were used for 2 things... and really 2 things only: Chocolate Chip cookies, (made and inhaled in December) or a monster peanut butter fluff sandwich on cheap white bread...sprinkled with the chips: toasted and then years later we moved this concoction to the microwave. All of this an indoor sport of sorts. Enter a moment out of the norm. We seem to thrive on such moments in each family household. On a recent very warm weekend, when company gathered at our son James' house... the desire for warm gooey cookies won out over sensibility... "sensibility"something that I used to hold as a rule. Amen that such rules don't govern giggles and messes anymore. Jessica pulled out the ingredients and let the boys have at it - the egg smasher high tailed it out of there when he had enough of the cooking fix. This mixture was perfected outside on their front stoop. It felt like a mid-eastern summit... all the cooks sitting on the ground, one hand on a spoon and watching each other's move. But the batter was mixed, sugar and spices added, and off Jessica went to the kitchen to set the timer. All we had to do was wait, and salivate! 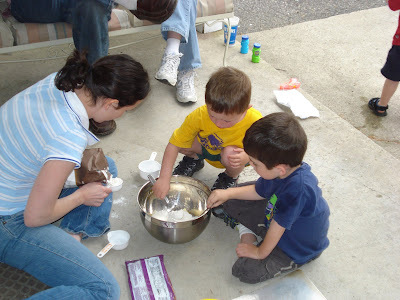 So, blowing bubbles, chalk drawing, and kite flying just got a new outdoor activity on the list: mixing up goodies. That evening we did cook s'mores and we ate fresh cookies! Who says one has to stay in the kitchen anymore?